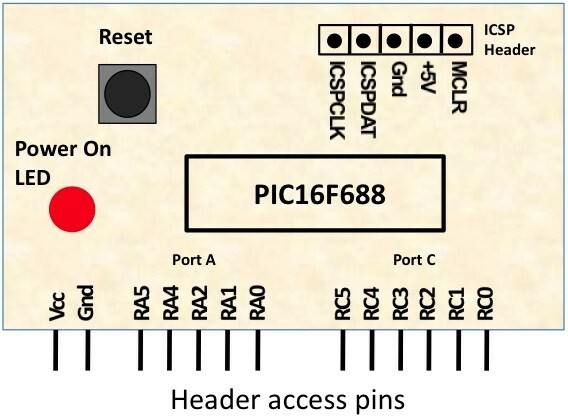 This module is based upon the basic setup circuit for PIC16F688 that I have described in one of my PIC lessons, Getting ready for the first lab. I thought of soldering this circuit on a general purpose ptototyping board and use male headers to access the power supply pins and I/O ports of the PIC16F688 microcontroller. This will free up a lot of space on the breadboard as the ICSP header and the reset switch are transferred from the breadboard to the module. 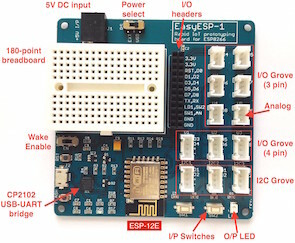 This will make prototyping on the breadboard easier and quicker. The general layout of the module is shown below. It is followed by the circuit diagram.